from 10am till 3.30pm each day, with a lunch provided (Messy Church style). It will run over 4 sessions, each about 2.5 hours long, with the meal in between. It is free, aimed at ages 5-11. Next planning meeting on Tuesday 30 June, 2pm at St John's Church. If you have ideas/resources appropriate to the theme, please contact Pauline Wright beforehand, to help her planning. All children between 5 and 11 welcome - older children (over 12) welcome as helpers but older children please contact us beforehand. 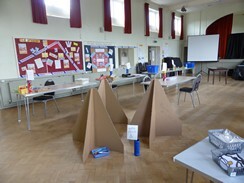 The picture on the right shows the hall ready set up for our first day last year on 12 Aug 2014. We expect between 25 and 50 children!!.. Make sure you are one of them! Crafts, games, fun, songs, thoughts and friendships. Could you help as a volunteer?